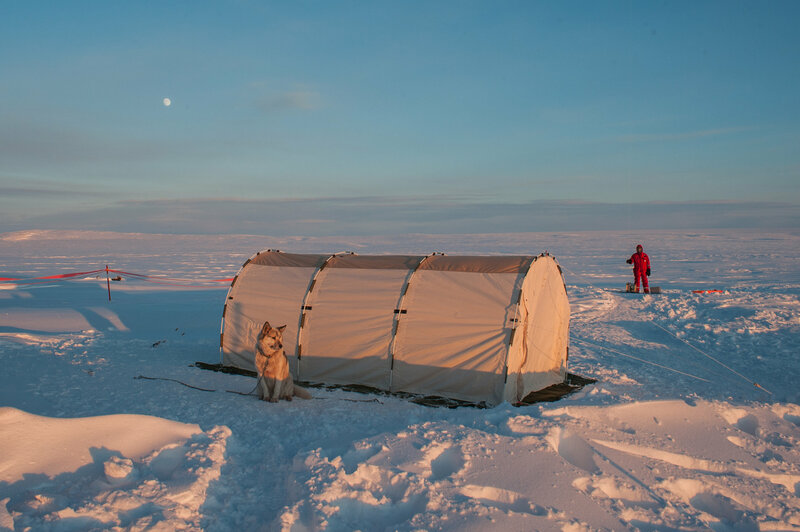 A photo in the NYTimes article Ice Surveys and Neckties at Dinner: Here’s Life at an Arctic Outpost has got me thinking. During the winter months at either the north or south pole, when it is constantly dark, how does the Moon behave? Would a nearly-full moon sometimes circle for days without setting, or would it still rise and set, or would it be all together missing, or some combination of all of the above? The moon is quite interesting as you get near the poles. It still moves round due to the Earth's rotation once a day, but it also orbits with a period of a month so what you get is two weeks of moon above the horizon followed by two weeks where you cannot see it. What changes through the year is what phase you see when the moon is visible, and in the middle of winter you have two weeks around full moon, whereas in summer you have two weeks around the new moon - not so exciting. Spring and autumn obviously have two weeks around first and last quarter, respectively. This simulation using Stellarium shows the effect quite well. At the beginning of Winter, when it's nighttime all of the time, the moon would be in the sky for the 2 weeks closest to Full Moon, and then below the horizon for the next 2 weeks. And at the beginning of Spring (click on the graphic), when the sun is at sunrise all of the time, the moon would be up in the sky for the 2 weeks closest to First Quarter (waxing), and then below the horizon for the next 2 weeks. The animated graphic above shows what we would see from the North Pole if we went out every day at noon, for 14 days in a row, from March 1st to March 14, 2006. We start with a thin crescent moon near the horizon, and end with a full moon near the horizon. Halfway through, the First Quarter moon would be when the moon is highest above the horizon. Keep in mind, that if you were observing the moon constantly, throughout a 24 hour period, the moon would seem to move to the right in the sky along with the sun, stars, and planets due to the Earth's rotation. Nothing would seem to rise and set: they would just seem to circle around you. Not the answer you're looking for? Browse other questions tagged the-moon night-sky or ask your own question. Why celestial objects appear brighter in the night sky than in photographs from closer proximity? How does the sun move over the year in the sky of the Moon? What did the night sky look like 100,000 years ago?